BSE Sensex closed higher by 207.10 points, or 0.55%, to 37,852, while the Nifty 50 rose 79.35 points, or 0.70%, to close 11,435. 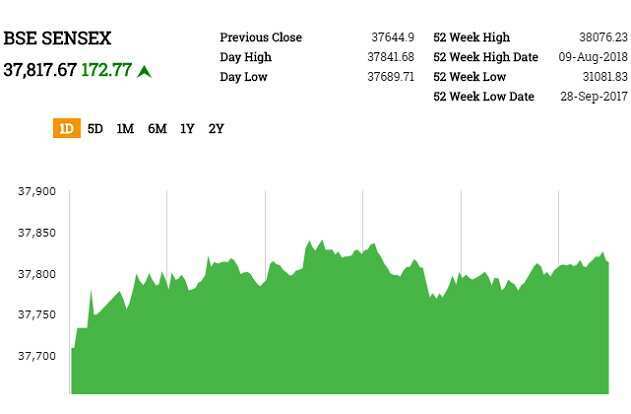 During the day, the Sensex surged 287.5 points to a high of 37,932.40 and the Nifty 50 rose 96.7 points to a peak of 11,452.45.BSE MidCap and SmallCap advanced 0.89% and 0.53%, respectively. Among the sectoral indices on BSE, healthcare gained most at 2.48% followed by realty, energy, bankex and finance. Industrials, telecom, power and capital goods declined.Sun Pharma, Yes Bank, ICICI Bank, Reliance Industries and Axis Bank were among the top gainers, whereas UPL, Adani Ports, Hero MotoCorp, LT and Bharti Airtel were among the major losers. Bitcoin dropped below $6,000 and dozens of smaller digital tokens tumbled as this month’s selloff in cryptocurrencies showed few signs of letting up. The largest digital currency fell as much as 6.2% to $5,887 as of 3.07pm in Hong Kong, the lowest level since June, according to Bloomberg composite pricing. Ether sank as much as 13%, while all but three of the 100 biggest cryptocurrencies tracked by Coinmarketcap.com recorded declines over the past 24 hours.The total market capitalization of virtual currencies dropped to $192 billion from a peak of about $835 billion in January, erasing much of the gains seen during the speculative mania at the end of 2017. Ether has tumbled 39% this month, while Bitcoin has dropped about 22%. The government on Tuesday blamed external factors for the rupee’s fall to an all-time low against the US dollar and said there is nothing to worry, reported PTI. Economic affairs secretary Subhash Chander Garg said the “rupee is depreciating due to external factors” and there is “nothing at this stage to worry”.In early trade today, the rupee crossed past the psychological 70-mark to hit an all-time low of 70.08 a dollar for the first time amid concern over the risk of contagion from Turkey’s financial-market turmoil. However, the home currency recovered and was trading at 69.86, up 0.09%, at 1.47pm. Steel Strips Wheels Ltd shares fell 1.7% to Rs 1180.10 from day’s high of 1220.65. The company reported a profit after tax of Rs 21.51 crore in the quarter ended 30 June, compared to Rs 16.41 crore a year ago. Revenue from operations stood at Rs 501 crore in the June quarter, compared to Rs 351 crore in the same period last year. Lincoln Pharmaceuticals Ltd shares jumped 2.93% to Rs 246 after the company reported a profit of Rs 16.07 crore in the quarter ended 30 June, compared to Rs 4.92 crore last year. Consolidated revenue from operations compared to Rs 99.82 crore in the June quarter, versus Rs 150 crore a year ago. BSE Sensex traded higher by 172.77 points, or 0.46%, to 37,817.67, while the Nifty 50 rose 61.05 points, or 0.54%, to 11,416.80. 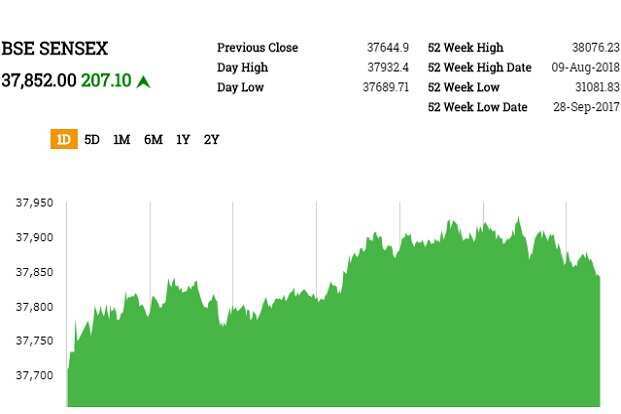 In intraday trade, the 30-share index rose 196.78 points to 37,841.68 and the Nifty 50 surged 63.6 points to 11,419.35.BSE MidCap and SmallCap rose 0.14% and 0.38%, respectively. Among the sectoral indices on BSE, realty and IT gained most at 1.13% and 1.11%, respectively, followed by teck, FMCG, bankex and finance.Axis Bank, Tech Mahindra, Wipro, Hindustan Unilever and Yes Bank were among the top gainers, whereas Adani Ports, UPL, HPCL, Vedanta and Bharti Airtel were among the major losers. Is your stock going the Elon Musk way: Planning to go private? When a company goes private, the buyers—who often constitute the company’s management or private equity firms—make a bid for the company. Logistics company Gati Ltd’s shares fell as much as 5.1%, their biggest daily percent loss since 27 June. The compay reported a 71% decline in its June-quarter profit at Rs 5.08 crore. Quarterly expenses rose 5.6% to Rs 452 crore. Gati’s stock has fallen 23.6% this year as of last close. Cadila Healthcare shares traded 3.89% to Rs 340.75. The company on Monday said that it has entered into an agreement to acquire 51% share capital of Windlass Healthcare Pvt Ltd. The cost of acquisition is ₹155.55 crore and it will be completed by end of September 2018, it added. Also, the company posted over three fold jump in consolidated net profit to ₹460.5 crore for the quarter ended 30 June, 2018 on account of robust sales. Its net profit was ₹138.4 crore in the year-ago period. The Indian rupee erased all the morning gains and crossed past the psychological 70-mark first time against the US dollar as the contagion from the economic crisis in Turkey remained relatively contained in developed markets overnight. At 10.34am, the rupee was trading at 70.08 a dollar, down 0.21%, from its previous close of 68.93. The home currency opened at 69.84 and touched a high of 69.75 a dollar. Earlier in the opening trade the currency gained nearly 0.2% after consumer price inflation slowed to nine month low, providing comfort to the government and Reserve Bank of India. PVR shares rose as much as 3.18% to Rs 1,323.85. PVR on 12 August said that it has agreed to buy a 71.7% stake in SPI Cinemas Pvt. Ltd for ₹ 633 crore—a move that will help India’s largest multiplex operator boost its presence in the lucrative south Indian market. The acquisition of SPI, the largest cinema exhibitor in south India, will make PVR the seventh largest cinema exhibitor in the world. Ruchi Soya Industries Ltd shares rose 5% to Rs 9.43 after the company posted a profit of Rs 22.60 crore in June quarter against loss of Rs 286 crore last year same quarter. Moreover, the Competition Commission of India has approved the acquisition of Ruchi Soya by Adani Wilmar. Adani Wilmar had emerged as the highest bidder (H1) with an offer of about Rs 6,000 crore for Ruchi Soya, which is facing insolvency proceedings. Shares of Jet Airways India traded 1.36% lower at Rs 282.60. 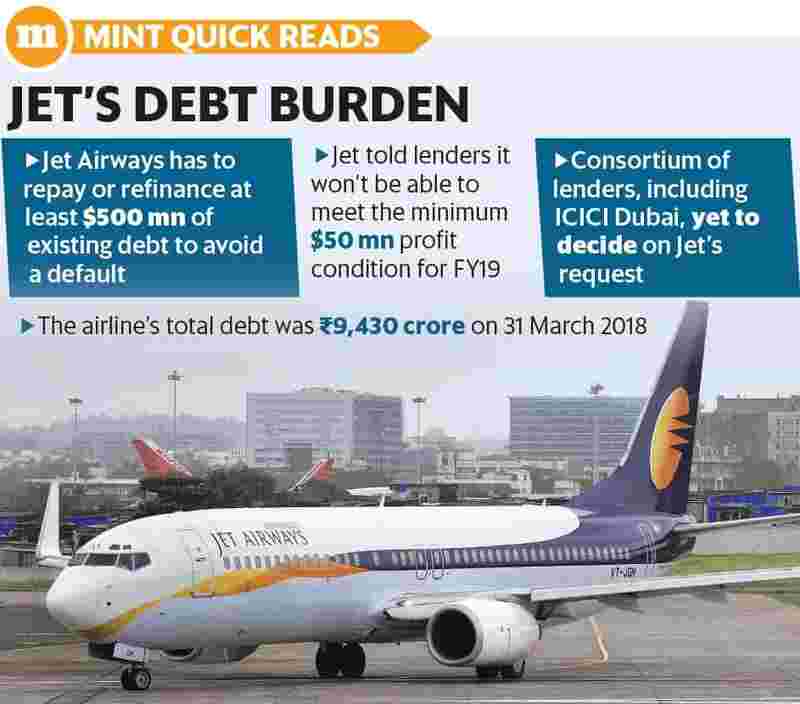 The company has written to a consortium of overseas lenders, seeking a waiver of a loan covenant on its existing debt facility of about $185 million, Mint reported, citing two people directly aware of the development said. Jet Airways shares have taken a beating in recent days. They declined nearly 14% in the last 30 days. Tata Steel Ltd rose as much as 3.12% to Rs 587 after its consolidated first-quarter net profit more than doubled to ₹1,934 crore from ₹921 crore in the corresponding period of last year. The growth in earnings was backed by burgeoning sales growth in the automotive and industrial sectors, and better operational efficiencies. Banking stocks gains after retail inflation slowed to nine month low in a relief for the government and the Reserve Bank of India. Punjab National Bank rose 1.6%, Bank of Baroda 1.6%, State Bank of India 1.3%, ICICI Bank 1.1%, Axis Bank 1.1%, Federal Bank 1.1%, Yes Bank 0.8%. The Indian rupee and 10-year bond prices rose on Tuesday after retail inflation slowed to a nine month low, providing comfort to the government and Reserve Bank of India. The rupee was trading at 69.76 a dollar, up 0.24%, from its previous close of 68.93. The home currency opened at 69.84 and touched a high of 69.75 a dollar. On Monday, the rupee hit record low at 69.93 as emerging-market currencies weakened amid concern over the risk of contagion from Turkey’s financial-market turmoil. BSE Sensex traded higher by 150.55 points, or 0.40%, to 37,795.45, while the Nifty 50 rose 39.80 points, or 0.34%, to 11,394.80.